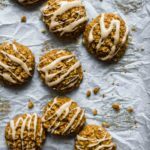 Soft, perfectly pumpkin spiced, and somehow gluten-free and vegan, these pumpkin oatmeal cookies are ideal any time of day, preferably when they're generously coated in maple glaze. Preheat oven to 350 degrees F. Place 1 cup of the rolled oats in a food processor or high-speed blender and blend on high speed until the oats become a flour-like consistency - you now have oat flour. Place in a large bowl. Add the pumpkin puree, olive oil, maple syrup, baking soda, pumpkin pie spice, and salt to the bowl and stir vigorously (I like to use a fork) until everything is well-blended. Scoop batter using a cookie scoop or a tablespoon onto two baking sheets lined with parchment. Bake for 15 minutes, or until edges are golden and cookies are set. They will be soft! While cookies are baking, in a small bowl whisk together powdered sugar and maple syrup until smooth. Drizzle over cookies in whatever pattern you like! Cookies keep for 2-3 days well-wrapped on the counter, or 1 week in the fridge. You can also freeze them wrapped individually in plastic wrap, and then microwave for 10-15 seconds any time the cookie craving strikes.